Whatever would have been predicted as the eventual result of the PV Sindhu-Nozomi Okuhara second-round encounter in the Japan Open Superseries badminton championships, even the most ardent supporter of the 22-year-old Japanese world champion could not have bargained for what did transpire at the Tokyo Metropolitan Gymnasium on Thursday. A listless display from the lanky visitor to the land of the rising sun ensured that the one-sided clash ended in a 48-minute 21-18, 21-8 rout, with the darling of the local crowds winning 26 of the final 34 points as Sindhu visibly wilted. From a marginally inferior position of 16-18 in the opening stanza, the effervescent 5 ft 1 inch (1.51 metres) tall Okuhara picked up the requisite five points for the game in a reel, and then simply mounted a blitzkrieg to leave Sindhu panting and desolate, and unable to stay with the pocket-sized Japanese star in the rallies. Chief coach of Prakash Padukone Badminton Academy, Vimal Kumar, who coached Saina Nehwal for the past three years until her return to the Gopichand Academy in Hyderabad, was of the opinion that Sindhu would probably have been tired by the lengthy match she had to play against Okuhara in the Korea Open final last Sunday, just four days earlier; and also after the tough opening round against Minatsu Mitani in the ongoing tournament. “It is a very tough task for our women to play the Japanese girls on their home soil, because the shuttles used in the Japan Open are very slow, and do not suit hard-hitters all that much,” he said. “It is really hard to play Okuhara under those conditions where virtually every smash comes back, and you are forced to play the rally game. 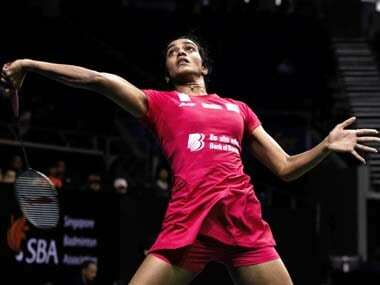 I feel Sindhu was not physically and mentally prepared to play another energy-sapping game on Thursday,” he added. One factor was indubitably established after the debacle, that Okuhara’s physical fitness levels and mental strength are superior to those of Sindhu. Signs of these were visible in both their two most recent matches. Even when Okuhara trailed 17-19 in the decider of their World Championship final in Glasgow, she recovered more quickly than Sindhu from the rigours of a long rally; and in fact, did a little pantomime on court, bounding about and doing short little runs as one does in shadow practice. The Japanese diminutive dynamo rallied to win the gold medal at Glasgow with a 22-20 finishing gallop; and was also on the point of doing an encore in Seoul, but Sindhu managed to hold her off. If one accepts the fact that both players suffered from their long-drawn 83-minute final at the Korea Open, then, too, one has to concede that Okuhara’s recovery is faster; and therefore, fitness levels are better. Although Sindhu was easily tamed in Tokyo by Okuhara, Indian supporters still harboured the hope that the erstwhile queen of the shuttle game in their country, Saina Nehwal, would take the country’s pennant forward. However, the unseeded 27-year-old Indian had few answers to the all-round strokeplay and speed of two-time former world champion and Rio Olympics gold medalist, Carolina Marin, and capitulated meekly at 21-16, 21-13 in a matter of 43 minutes. Nehwal was in the match with 13-9 and 14-10 leads in the opening game. But once the left-handed Spaniard neutralised her advantage at 15-all, she simply planted her foot down on the gas pedal, and left the Indian gasping in her wake. There was a brief spark from Nehwal at the start of the second game, but after 6-all, Marin simply streaked away, and was never headed off. The losses suffered by Sindhu and Nehwal meant that Indian interest in the women’s singles of the $325,000 tournament fizzled out, leaving four Japanese players in the quarter-finals of their home event, each one facing a foreigner at the last-eight stage. Marin is pitted against the No 2 seed, Akane Yamaguchi, while Okuhara takes on eighth-seeded Beiwen Zhang of the US in the bottom half of the draw. The top half features Aya Ohori (who fortuitously took the place of top-seeded Tai Tzu Ying, a last-minute withdrawal as a result of a shoulder injury) versus unseeded Chinese Chen Yufei, conqueror of seventh-seeded Thai, Ratchanok Intanon; and another unranked Japanese, Sayaka Takahashi against sixth-seeded Chinese He Bingjiao. So far as the men’s singles goes, matches followed a much more expected route, with seven of the eight seeds making the quarter-finals, the sole exception being India’s HS Prannoy, who made the grade by notching a 21-16, 23-21 win against Hsu Jen Hao of Chinese Taipei, victor over Hong Kong’s No 6 seed, Ng Ka Long Angus in the opening round. The rock-steady Prannoy experienced some anxious moments in the second game before getting the measure of the Taiwanese player. He will clash with the 20-year-old No 2 seed Shi Yuqi of China, who huffed and puffed before subduing Sameer Verma by a 10-21, 21-17, 21-15 scoreline. Sameer, who had a storming start to the match, fell behind early in the second game, and found it impossible to fully make up a 7-17 deficit though he did try his utmost. That second-game effort sapped the Indian’s staying powers, and Shi, the 2017 All England runner-up, pulled away after 7-all to take the decider without undue trouble. The other quarter-final matches, which all promise to be humdingers, will have top-seeded South Korean, Son Wan Ho, taking on Lin Dan, who had beaten him in the semi-final of the recent World Championships in Glasgow; fifth-seeded Lee Chong Wei of Malaysia against the No 4 seed, Chou Tien Chen of Chinese Taipei; and finally, the reigning world champion and No 3 seed, Viktor Axelsen of Denmark against India’s No 8 seed, Kidambi Srikanth. Srikanth was in sparkling form as he blasted Hong Kong’s Hu Yun off the court, for a most impressive victory in a minute short of the half-hour mark, at 21-12, 21-11. The Indian goes into the match against Axelsen with the scores locked at 2-2 in the matter of career meetings, although it must be said that the giant Dane has won their last two meetings, the most recent by a thumping 21-7, 21-12 scoreline on his way to the 2017 India Open title. Both Srikanth and Prannoy would fancy their chances against their respective opponents, although the former might be at a slight disadvantage since the power in his smashes could be blunted by the slow shuttles being used in the competition. But then, that problem will also affect the hard-hitting Axelsen; and the match could come down to a single factor – who controls the net and gets his rival to lift the shuttle to the midcourt, for the administration of the coup-de-grace.